More premature deaths from heart attacks and strokes could be caused by extra air pollution caused by a new Ikea store in Sheffield, a report says. The report recommending plans for the store in Tinsley are approved said the store will have a negative impact on the area’s ‘already poor air quality’ and cause a ‘small number’ of additional premature deaths. But the report also states the store will have health benefits by creating jobs and training opportunities. 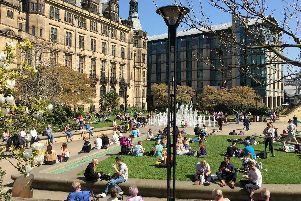 The council’s air quality action plan, published last year, revealed pollution is causing an estimated 500 premature deaths a year in Sheffield, with annual health costs of around £160 million. The report to next Tuesday’s planning meeting, where a decision will be made on whether the store will get the go-ahead, said council director of public health Jeremy Wight says the new Ikea will cause ‘negative health effects’ because of the impact on air quality through extra car journeys. It said: “These will affect some of Sheffield’s most deprived neighbourhoods with some of the worst measures of health and air quality. “However he recognises that these negative health effects need to be balanced against the positive health gains associated with the creation of more jobs and training opportunities. “The increased traffic is likely to lead to increased respiratory and cardiovascular problems, including heart attacks and strokes, will also probably lead to a small increase in deaths, as evidenced by multiple international studies and systematic reviews. “The actual worsening of air quality is, in proportional terms, small, but it is a small proportional deterioration of air quality that is already very bad. “It is the view of the council’s director of public health that the public health harm caused by the slight worsening of already poor air quality, whilst not precisely quantifiable, will comprise additional cases of respiratory and cardiovascular disease, and will lead to a small number of additional premature deaths. “This is despite the effects of the mitigating measures, and these health harms will occur in a part of the city that already has poor health, and so will exacerbate health inequalities. Planning officers say the benefits to the local economy, creation of 700 jobs and extra visitors outweigh pollution, traffic congestion and a ‘marginal detriment impact’ on the city centre.